It’s summer in Chicago and we love how the whole city comes to life! There is always something to do, but sometimes it can feel like you’re doing the same thing every summer. We’ve compiled a list of things you didn’t know you could do in Chicago for those who are ready to shake things up! The widely known pedal taverns have made their way to Chicago, but with a twist. Put a bike and a boat together, and you get a cycleboat! 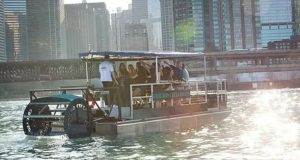 Chicago Cycleboats have the riders pedal to turn the paddle wheel that gets the boat moving. The boat can hold up to 14 people, with only 10 seats for pedaling. Don’t worry because it is completely safe to stand and walk around the paddleboat! The best part is that it’s BYOB and has coolers built in to the boat. Perfect for a hot summer day! A new social and active way to get out, see the city and have fun! Finally, adults will be able to live out their Night at the Museum fantasies as the Field Museum will be hosting its first ever adults only sleepover. The “Dozin’ with the Dinos” program started in 2012 and has previously only been available to families with children ages 6-12. In honor of the addition of Maximo the Titanosaur, they are letting adults get in on the fun too. This sleepover takes place on July 7th going from 6:00 PM to 9:00 AM. 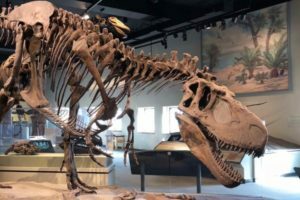 Tickets include dinner, a midnight snack, and breakfast, as well as having access to exhibits in the museum all night long. Hopefully none of the artifacts come to life! Chicago Night Flights is a series of miniature beer festivals that will be hosted in Wrigleyville, Logan Square, West Loop, and on the Chicago Riverwalk. The next event will be held on June 29th at the Milwaukee Avenue Corridor, and will be every few weeks after that at different locations. Admission to the events is free, but if you want to try any of the craft beers you’ll have to buy a sampling pass. The Happy Place is coming to Chicago! This pop-up exhibit is filled with larger-than-life installations and sensory themed rooms, filled with all things that make you happy. 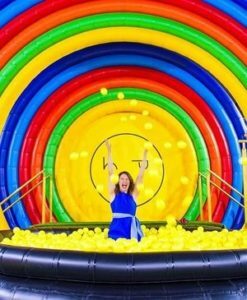 You can jump from a rainbow into a pot of gold, get blown away in a confetti dome, or surround yourself with rubber ducks. It’ll be open from June 28th to August 6th. Located in River West, you won’t want to miss this Instagram-worthy opportunity! Chicago has beautiful views from a rooftop, and now you can enjoy those views while swimming in a pool. Here is a little known fact for you- some hotel pools allow free access to everyone, not just hotel guests. Try visiting the Viceroy or Robey Hotel to use their pool when you’re in need of a day-cation.